Hair-raising Songs And Stories Loom TV5’s Kanta Pilipinas Auditions!!! Inspirational Diva and audition judge Ms. Jamie Rivera was excited to listen to the stories of the Cagay-anons. Award winning Cross Genre Composer, Arranger, Producer Mr. Jimmy Antiporda raised eyebrows asking a couple who sang on the stage. “May conflict ba yan?” relating to the girl singer and pianist boyfriend as he was alluded in the same shoe with Ms. Jamie Rivera in the past. Ms. Maristel Sampedro became the comic relief throwing funny comments at gays impersonating Whitney Houston on the stage. What astounded the judges and onlookers was the ex-convict contestant who vented denouncing his past as a former member of the Akyat-Bahay gang. There was also one with 11 siblings living in different parts of Mindanao hoping to be reunited with dreams through Kanta Pilipinas. 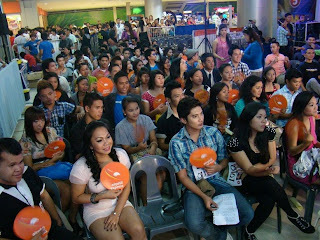 Fun and more fun of TV5’s Kanta Pilipinas’ call for the nation continued in Cebu last March 2, 2012. Hosted by Jhai’Ho, the event center of SM CITY CEBU filled the mall with 424 registrants and more than a thousand onlookers and mall-goers when TV5’s Kanta Pilipinas began the auditions. Simply upload a maximum of 5-minute video of your performance to our website www.kantapilipinas.com. Use your name and age as the title of the video. And do not forget to leave your address, email and contact numbers on the description bar. See the Kanta Pilipinas Official Music video featuring Ms. Lea Salonga on the Kanta Pilipinas YouTube Channel and browse through the audition videos and vote for your favorite! Like Kanta Pilipinas on http://www.facebook.com/KantaPilipinas or follow us on Twitter @kanta_pilipinas.